Now is a great time to upgrade your old heating and air unit. The new more efficient HVAC systems are available with 0% interest, financing options are available and you can qualify for Santee Cooper rebates. From now until March 31, 2019, if you buy a 16 SEER or Higher Trane unit, you will receive a FREE Nexia Programmable Thermostat, FREE Nexia Indoor Security Camera, FREE Z-Wave Light Bulb and reduce your energy bills with the peace-of-mind that your unit is reliable and backed by a local company. 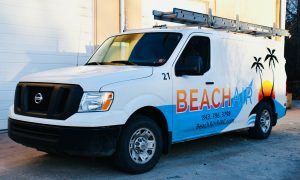 At Beach Air, we service the entire Grand Strand from Little River to Georgetown. Our fleet of vehicles are ready to serve you 365 days a year to make sure your home and business are comfortable. Free onsite estimates for installs available now so call us at 843-796-3798.